Pubudu Chathuranga in lead roles along with new entrant Sheshadri. ‘Challengers’ mark the first time that seasoned actor Lucky Dias will take on a role in one of Udayakantha’s creations. Experienced actresses Sangeetha Weerasinghe and Vasanthi Chathurani will also contribute to the film. In addition to these artistes Dharshani Thivanka, Sarath Chandrasiri, Malintha Wijewardena, Heshan Manula, Arenaga Jeevantha and others will also be a part of the cast. Udayakantha will continue this trend of introducing more new faces to cinema with ‘Challengers’. ‘Challengers’ is Udayakantha’s 16th movie and will be shot in Colombo, Nuwara Eliya, Colombo and Nilaveli. The Cinemascope and DTS creation reflects how youths face hurdles and work towards overcoming them in life. Media Information Ministry Secretary W.B. Ganegala was the chief guest at the muhurath ceremony which was held at the National Film Corporation recently. 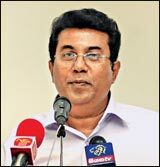 NFC chairman Jayantha Dharmadasa was also present at the event. The movie will be yet another product combined by director Udayakantha and assistant director Donald Jayantha. Jayanath Gunawardena will handle the camera while Pravbeen Jayaratne will be the editor of the project. Sunflower Films will produce the movie which includes the story and script penned by the director. Indika Udara Lanka is in charge of the hairstyles and make up. Manjula Ayagama is the art director and Asoka ariyaratne is the production manager. Shan Perera will choreograph a number of dance scenes in the film which includes songs penned by Sunil Wimalaweera, Nilar N. Cassim, Vasantha Dukgannarala, Padmakumara Metthasena, Ariyasinghe Perera and Kaushith Malinda. Aruna Lian, Dilan Lambi, Nisal Gangodage and Ravi Hans have set the songs to melody. The background vocals are by Uresha Ravihari, Nalin Perera, Surendra Perera, Lesley Thomas, Bavi Susan, Abhisheka Wimalaweera, Chalitha Weerakoddi and Nadee Kahatapitiya. Mahesh Nishantha is the still photographer. Seasoned director Vishwanath Buddhika Keerthisena set foundation for his new movie Maatha at a muhurath ceremony held at the Cinnamon Grand hotel recently. key figures of the security sector and the movie industry graced the occasion which unveiled a Boodi’s latest project which will be based on a true life incident. The movie opens with the LTTE attack on the Yal Devi train. The story revolves around a middle class Tamil family who are living a tragic existence amidst the shadows of terrorism. The movie will portray how individuals overcome life in the dark period when a part of the country was within the grasps of terrorism. It will uphold the picture of patriotism and makes you wonder why each and every individual should not have the luxury of living in harmony and breathing freely in a country that has much to offer to the world. Many experienced and popular faces will be apart of the Maatha cast. 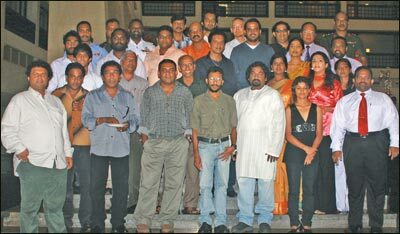 They include Ravindra Randeniya, Mahendra Perera, Kamal Addarachchi, Buddhika Jayaratne, Dharmapriya Dias, Vasantha Vitttachchi, Dharshana Manoharan, Suranga Ranawaka, Yashodha Ijas Fa and others. 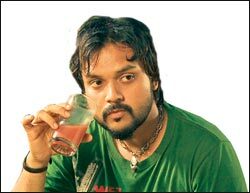 Reputed vocalist Gayan Perera will also make his entrance to movies as an actor in Maatha. The script is by Professor Ariyaratne Athugala. Ruwan Jayasinghe will produce the movie along with Viajya Ratnayake and Saree Mandir proprietor Sanath Ranaweera. Milton Caan who had won a lot of applause in many international film festivas including the Berlin film Festival is the cameraman for the movie. Duminda Vidanagamarachchi is the assistant director, Joe Fizal is the editor and Deepthi Weerasuriaya is the production manager of Maatha. The line producer is Nilantha Perera while the Prasanna Veerakoddy is the art director. Vasanthi Vittachchi handles the make up department and Kumara Karavideniya is the costume designer. Ruchira Kahanda does the hairstyles. The music is by Lakshman Joseph de Sarem. Nimal Vijesiri Senadheera is the production executive. Sri Lanka Rupavahini corporation is the media sponsor to Maatha. Shooting will commence in Colombo and the actual areas that were affected by terrorism. Knowledgeable people among us know what “Film” is and what “Criticism” is all about. And yet, for the benefit of young people who would like to know about these things from a professional point of you we may have to go to the generalities of the subject. Film - there are sweeping definitions to it. Two examples are suffice: “the most important of the arts”; “an art only on sufferance”. Criticism as we all know should be constructive as to show the merits and demerits of the work discussed and should be based on unbiased standards of values. However complete or final criticism is not possible but only certain aspects like the content and technical aspects of the film seen could be given to enable the filmgoer to form a picture of the film the person has seen or going to see as a whole. There are many schools of film criticism as there are many approaches to literary criticism. Basically there are academic oriented critiques as found in some classy film journals and books; and reviews in popular newspapers and journals. In those days “Sight and Sound” for instance was considered high level film criticism. There are two kinds of film reviews in popular media. One is the media: reports on films, players and the like by film journalists and studied film reviews by journalists as well as by knowledgeable film and literary critics. The criticism or personal reactions or interpretations of a critic helps the public to better understanding or appreciation of the film seen or to be seen. One may not agree with the critic most times, but we must accept the fact that varied interpretations are also possible. Film critics can influence a larger audience by their genuine criticism. 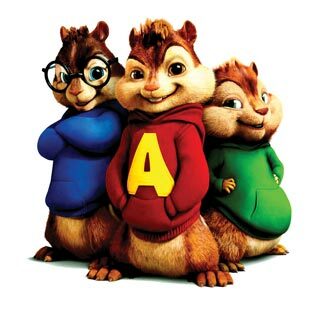 Despite all that a badly made film without any artistic value can be popular with the masses and really a good film well done could only be appreciated by people with artistic sensitivity. Film should entertain first. That is a norm in any art form. In very popular box office films the entertainment is not wholesome and is appreciable in parts. At the same time a very good popular film can also possess artistic merits. Nowadays such films are made in many languages from many countries. In the same way what is known as an’ arty film’ can also be full of fine tuned entertainment and not mere drab. We shall talk about the major functions of a film critic next week. The movie ‘Irony of Fate’ will be screened at the Russian Centre auditorium on November 28 at 5 p.m.
A New Year eve party goes away as four friends devour a little too much vodka in this witty, scenic comedy. With one man ending up in another city and another two passed out, the women in their lives begin to wonder exactly who they will see the New Year in with as the hands of the clock tick perilously close to midnight. Sirithunga Perera’s maiden effort at moviemaking Kanyavi will take to the wide screen in the CEL circuit towards the beginning of December. The movie which is produced by Indika Vijeratne flows along the lines of how an accidental meeting can have an impact on blissful family life. Though the title makes us pause and think twice, the actual story of Kanyaviis family oriented. Janaka is an educated and respected family man who seems to have the best of what life can offer. He has a devoted wife, a charming daughter, a satisfactory occupation and wealth. His peaceful existence is shattered on meeting Kumari, a pretty young girl who offers more than mere friendship when she asks for a lift from him on one night. Though they bid adieu to each other Kumari’s image haunts Janaka’s thoughts and she becomes almost an obsession for him. He craves for her to such an extent that he takes pains to track her down and talks her into moving into a separate place with him. Meanwhile Janaka’s friend, Madhawa, possesses an infatuation towards Janaka’s wife, Imaya. Though he has his problems with Tharushi, a young film actress who is constantly craving for his attention, he tries to take advantage of the situation when he realizes that all is not well in Janaka’s and Imaya’s marriage. The script of the movie had been in director Sirithunga’s possession for more than three decades before the project finally took shape. The main ideology which emerges through “Kanyavi is a celebration of womanhood. It reveals that a woman needs to be pure at heart and strong enough to deal with life’s challenges to lead a successful life. She is the foundation which steadies the family tree. Family is the focal point in our society,” director Sirithunga revealed. The creator of the first dual role drama Gmane Ya in 1976 which set the record for the most number of stagings for its kind added that this is a creation which should be seen by all the female population of the country. After his stint on stage, Sirithunga entered the television industry and went on to create a number of documentary and musical programs. He made a number of teledramas while introducing many new faces to the scene. A product of Cine Vision Lanka, Kanyavi stars Sanath Gunatilleke, Meena Kumari, Pubudu Chathuranga, Himali Sayurangi, Susila Kottage, and others in significant roles. Dilani Maurasinghe and child actress Samadi Sandaruwani make their entrance to the reel with the movie. It looks like the best picture race isn’t the only one that’s growing ­ the animated feature race is shaping up to have five contenders this year. Under rules of the Academy of Motion Picture Arts and Sciences, there must be at least 16 eligible films in a year to expand to five noms (at the other extreme, if fewer than eight enter, the category disappears). This year, 20 films were submitted for consideration. Since many of the toons have not yet opened, and since the Academy has not yet viewed all 20, it’s possible some will be disqualified.